This Ring Could Be Used to Sniff Out a Bomb #WearableWednesday « Adafruit Industries – Makers, hackers, artists, designers and engineers! 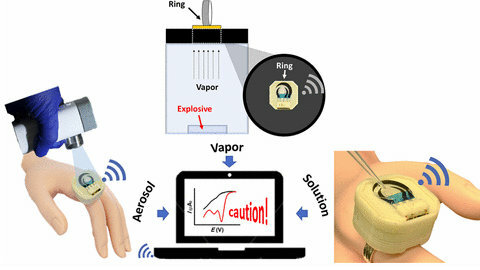 A new wearable device can detect chemical or biological threats, from explosives to organophosphates – toxic substances used in insecticides. Appearances aside, the ring shows promise for what the future could hold. It works using a hydrogel cover, which chemicals will diffuse through. When they hit a circuit board underneath, changes in the current are recorded and sent to a laptop using Bluetooth LE. 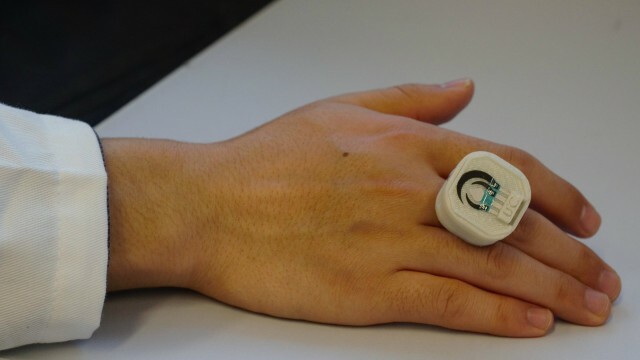 By monitoring how different threats cause different changes in current, the team could work out how to then identify those chemicals based on the activity of the ring. “Most wearable [devices] measure vital signs for sport or health,” Joseph Wang, a nanoengineer at UC and co-author of the paper, told The Register. Instead, his team wanted to use technology to spot signs of biohazards. Wang and the team expect it to be used in dangerous circumstances, and the reseach was partly funded by the US Defense Threat Reduction Agency Joint Science and Technology Office for Chemical and Biological Defense.